As a city, Wichita is already unlike any other, but what makes it especially intriguing are its unique features that entice foodies all over the country. 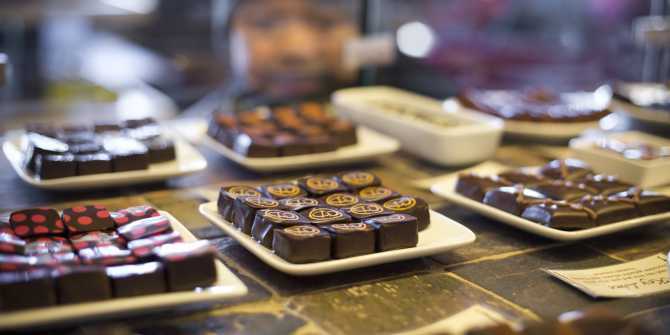 Whether you’re looking to feed a sweet tooth or are in the mood to celebrate Valentine’s Day, Wichita offers some unique chocolate experiences. If the pictures don’t already have you salivating, the flavor of these treats certainly will. 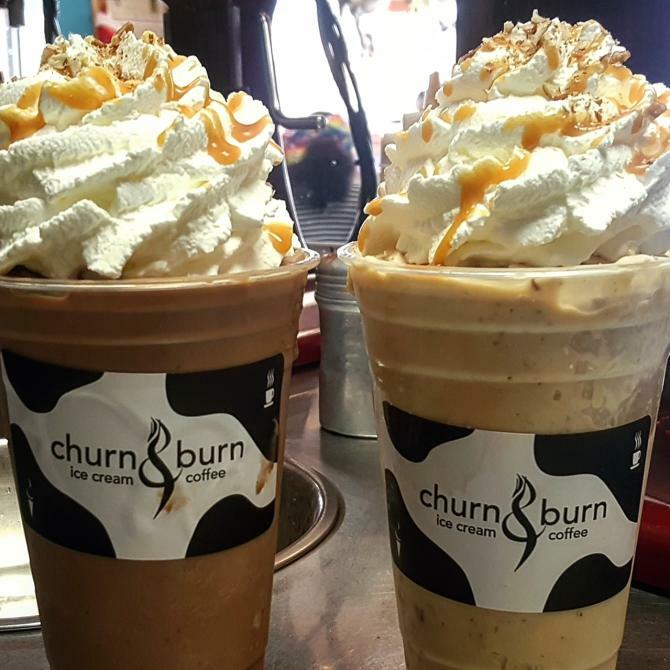 Churn & Burn offers a chocolate churn (ice cream) & burn (coffee), which is a house-made chocolate and espresso frozen with liquid nitrogen. Patrons also love the rich hot chocolate made with cream, brown sugar, vanilla and milk. Add a shot of espresso for a “Rockin’ Hot Chocolate.” For a Valentine’s Day exclusive, try the red velvet ice cream by requesting it in the store. Try a chocolate pairing in the Cocoa Dolce Artisan Chocolates Chocolate Lounge. 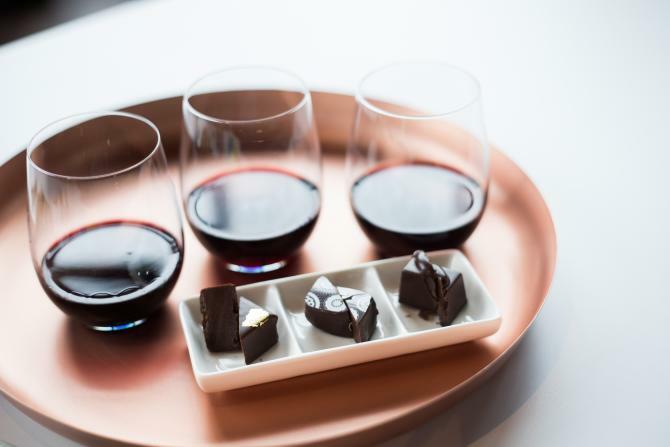 The shop offers flights of three wines and three chocolates paired purposefully together to help accentuate the flavors between the two. Choose from a flight of white, a few reds or bubbles and then taste the corresponding chocolates. Cocoa Dolce also offers several flavors of cheesecake including turtle, chocolate, and cookies and cream. Paired with a glass of bubbles or red wine, these can be the perfect end to a romantic evening. Enjoy these options in the Chocolate Lounge or at home. Explore the fusion between red wine and hot chocolate with the shop’s signature Red Wine Hot Chocolate. It’s the perfect match of the warm, fuzzy, “I love this wine,” feeling with the “This hot chocolate is amazing,” feeling. Pair this drink with a nice berry-flavored dark chocolate and voila! Match made in heaven! 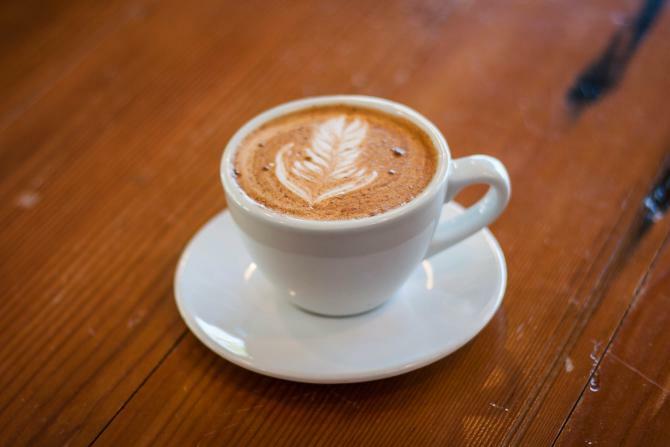 Gather your friends at Fairmount Coffee Co. and try the signature Aztec Mocha, which is a latte made with organic chocolate sauce, honey, cinnamon and a dash of cayenne pepper. If you’re not quite brave enough for pepper in your coffee, the regular mocha and hot chocolate both have the same chocolate sauce flavoring. Experience what is known as the “Cocoa Cloud,” a chocolate, vanilla and espresso under a cloud of foam. You should also be sure to try the raspberry mocha, a traditional-style mocha with raspberry syrup topped with whipped cream. At Flavors (formerly College Hill Creamery & Coffee Bar), the chocolate options are endless. Do you like s’mores? Try a s’mores mocha made with toasted marshmallow syrup, topped with whipped cream. If coffee isn’t your thing, be sure to try the old fashioned hot chocolate. During the month of February, you can even pick up the special spicy chile mocha. It’s made with a double shot of espresso, steamed milk, chocolate sauce and housemade chile syrup. This drink is topped with whipped cream and dusted with cayenne pepper and cinnamon. Try a delicious Cero’s Chocolate Whisk(e)y Pairing at Monarch! 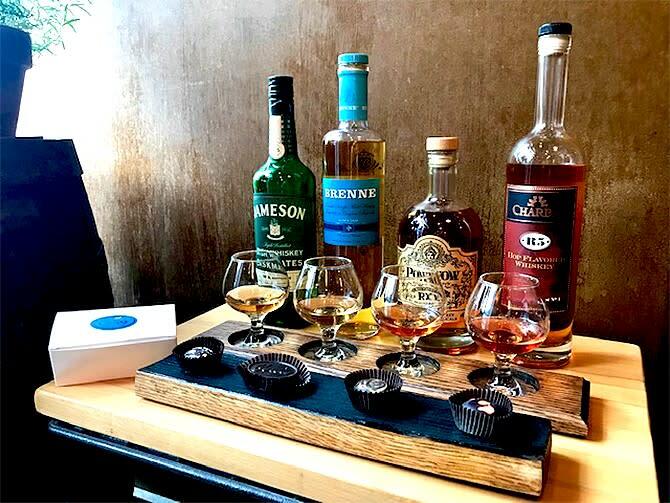 Only available until Feb. 28, these flights include items like a dark chocolate Earl Grey truffle paired with a Jameson IPA Cask Finish, a solid dark chocolate paired with Brenne French Whiskey, a dark chocolate Saigon cinnamon truffle paired with Pow Wow Botanical Rye or a dark chocolate passion fruit truffle paired with Charbay Hopped Whiskey. You won’t believe how perfectly these flavors go together! Want to try something super unique? How about a chocolate martini at Mort’s Martini & Cigar Bar? There are seven to choose from! Try a Sure Thing or a Dark Chocolate Martini - or one of several other libations to get your chocolate fix with. Mort’s also offers 160+ flavors when it comes to martinis and cocktails. 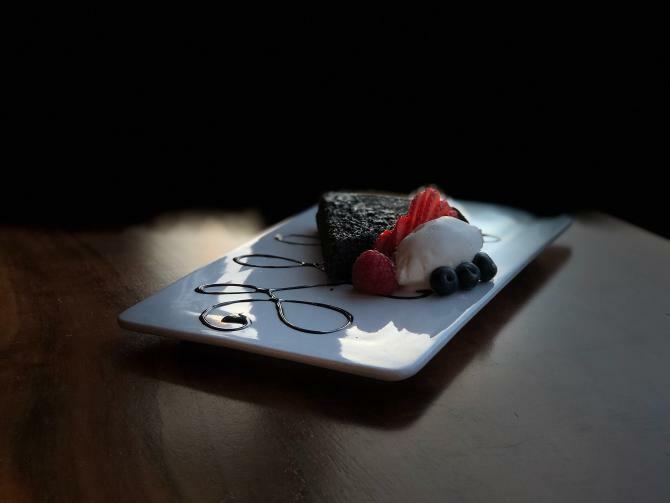 Order a regular mocha or other specialty drink at Reverie Coffee Roasters/Founders Bakery and a delicious flourless chocolate torte with fresh berries and homemade whipped topping. This decadent treat is the brainchild of the chefs at Founders Bakery, who make all their delicacies fresh daily. These are just a few of the unique chocolate experiences in Wichita. We also offer 8 hot chocolate experiences to combat the winter chill. While it falls right after Valentine’s Day, Hopping Gnome Brewing Company will be tapping a chocolate cherry stout firkin on Feb. 21, 2019. The beer will be available for one night only. Proceeds will go to promote Jana’s Campaign to support victims of domestic violence. Don’t Poke the Bear – the blend is a milk stout brewed with homemade Dutch cocoa syrup, cocoa nibs, Tahitian vanilla beans and Kenyan AA cold brewed coffee. Tarmac Oatmeal Stout – this brew tastes like chocolate or coffee finished with dry roasted notes. PB Cup Card Games – This milk stout has flavors of peanut butter and chocolate, creating a unique flavor for sweet beer lovers. Catherine III – this Russian Imperial Stout smells like chocolate with roasted notes and is also a crowd-favorite. 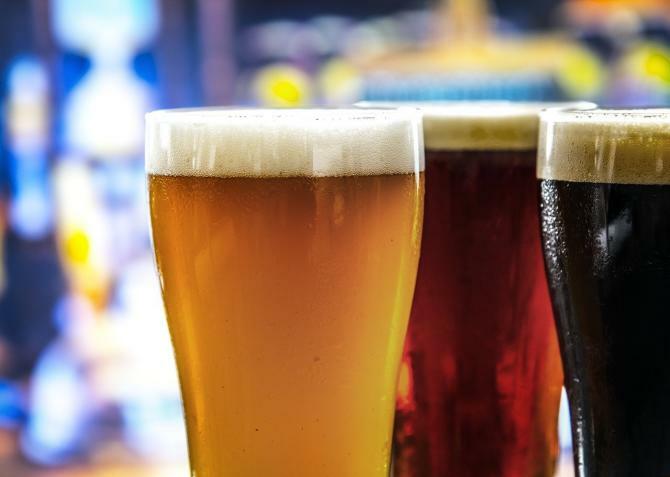 Learn more about Wichita’s local breweries and craft beer scene by booking with Brew Wagon Tours.